Myanmar’s leader Aung San Suu Kyi will today deliver a high-profile speech on her country’s democratic transition and is expected to touch on the 2017 Rohingya crisis. Suu Kyi has so far failed to recognise the military’s persecution of Rohingya Muslims in the restive northeastern Rakhine state—an act the UN decried as a “textbook case of ethnic cleansing”. 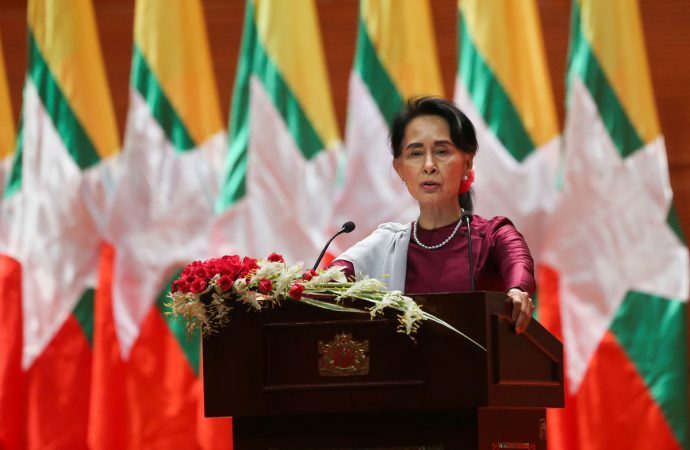 Aung San Suu Kyi’s silence stems from a fear of political backlash from the military. Myanmar is still on a shaky road to democracy, with only two political parties: Aung San Suu Kyi’s National League for Democracy, and the military-backed Union Solidarity Democracy Party. Whilst Suu Kyi’s party was democratically elected, both parties share power. Because Suu Kyi will only ever be the de facto leader of Myanmar—on account of the 2008 constitution, which prevents persons with foreign national children from holding office—it’s clear that Suu Kyi’s silence is strategic. By remaining silent, Suu Kyi is gripping onto her place at the core of Myanmar’s democracy. From here, she can continue spurring on Myanmar’s democratic transition and prepare for the elections in 2020.